Born and raised in East Tennessee, Dr. Johnson joined the Johnson City Internal Medicine family in 1986. He graduated from Vanderbilt University before pursuing his Doctor of Medicine at the University of Tennessee College of Medicine in Memphis. He is a member of the Tennessee Medical Association. 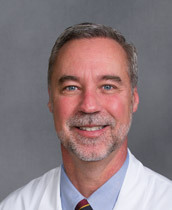 He currently holds the role of Adjunct Professor for the Department of Internal Medicine at ETSU's Quillen College of Medicine; he is also the Professional Roles Preceptor for the School of Nursing Master Program for East Tennessee State University and the University of Tennessee. Dr. Johnson holds special interests in preventative care and clinical research. His passion for medicine and serving those in our community is best summed up with one idea - "It is up to us to create the most out of healthcare for our patients." In his spare time, the husband and father of two enjoys spending time with his family and is devoted to his church.